A new arrival at London’s Whipsnade Zoo has boosted the world’s population of the endangered Grevy’s Zebra. The new filly foal with mum, Henna, at Whipsnade. Born on July 17 to first time mum Henna, the filly is running around and playing among the rest of the zoo’s herd of Grevy’s Zebra, including her dad, Abeba. “Henna is doing a great job of looking after her new arrival,”said Whipsnade’s Africa section team leader, Mark Holden. 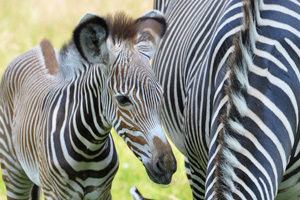 The leggy youngster was born with brown stripes that will turn black as she matures – her striped pattern is as unique as a fingerprint; no two zebra patterns are the same. She is the 27th foal to be born at the Zoo as part of a European Endangered Species Programme and is an important addition to the species which is classified as ‘Endangered’ on the IUCN Red List of Threatened Species with only an estimated 2500 animals remaining in the wild. In the past – particularly in the 1970s and 80s – the Grevy’s zebra suffered declining numbers due to commercial hunting for their skins and have continued to be affected by habitat loss. Last year, two Grevy’s zebras were born at the zoo within days of each other.